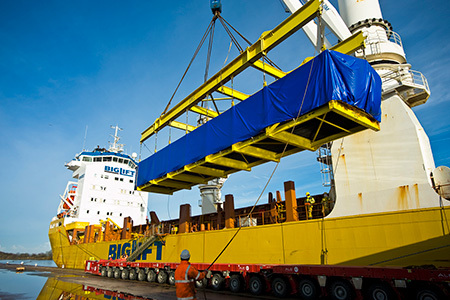 A photograph of the Big Lift on the quayside of the Manchester Ship Canal is the winning image in this year’s Ellesmere Port photographic competition and features in a new 2019 calendar. Quality Freight’s entry into the competition ‘Celebrating business in Ellesmere Port’, won first prize with their colourful picture. 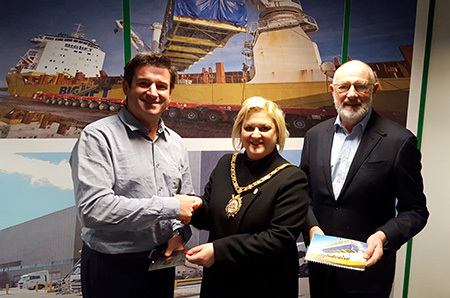 The Mayor of Ellesmere Port, Councillor Karen Shore, visited Quality Freight on North Road to hand Managing Director Sebastian Gardiner the first copy of the 2019 Calendar ‘The Port’s The Place’. Joint second prizes were awarded to Deborah Bowler for a picture of the filming of Tolkien at the National Waterways Museum, and to Peel, for a picture showing the new Prowell cardboard factory on New Bridge under construction. The 2019 calendar, which has been made with selected pictures, is available from all three Libraries in Ellesmere Port for £2. The photographic competition was held during the summer with over 100 entries received. The judging panel included the Mayor of Ellesmere Port, Justin Madders MP, Chris Farrow, Chairman of the Ellesmere Port Development, Celia Webber, Chair of the Ellesmere Port Local & Family History Society, and Adrian Waine, award winning photographer from Ellesmere Port. The judges were supported by an expert from the Ellesmere Port Photographic Society. The Mayor of Ellesmere Port, Councillor Karen Shore said: “Congratulations to all of the photographers featured in this year’s calendar. We received a very high standard of entries with the theme of celebrating business in Ellesmere Port.